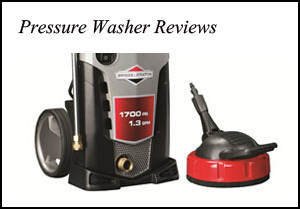 Forget about noisy and messy gas mowers that are hard to start and a pain to maintain. Make your lawn care simpler with an electric mower. These two models from Black & Decker have plenty of power and yet run quietly. Let’s look at them both and see which one will be best for you. The MM875 has a 19-inch wide deck to help you cut the lawn as quickly as possible. That’s one inch wider than the MM1800 described below. But we need to discuss one thing first, and that’s cord management. If you’ve never used an electric mower, go see one in action. Before you begin cutting, you’ll need to consider your path to avoid tangling the extension cord around obstacles or running over it with the mower. Black and Decker recommends keeping the mower within 100 feet of an outlet. That is the only downside to an electric mower. The upsides are numerous. Maintaining the MM875 means cleaning it off after mowing and sharpening the blade once a year. No oil changes, no battery charging, no gasoline or carburetors or any of the other work you’ll have to do with a gas or battery-powered mower. If you want to mulch the grass, just pop in the plug insert in the back of the mower. Mulching means no lawn cleanup after mowing and less fertilizer to buy. You can also gather the clippings with the included bag that attaches on the rear of the mower. Whether you are average height or not, the handle is adjustable so you can be comfortable pushing the MM875. It also collapses down so the mower can fit into small storage spaces. The grip is cushioned to dampen vibration so it’s more pleasant to hold than just plain metal. The deck is made of polycarbonate plastic with a lifetime warranty so you won’t have to deal with the body rusting out after a couple of seasons. The wheels are eight inches high in the back and seven inches in the front which makes it easy for the mower to deal with soggy ground and taller grass. Speaking of height, the deck adjustment is done with just one lever, and it ranges from 1-1/4-inches up to 3-1/2-inches. This means you can take care of yards no matter what kind of turf they have, from tall fescue to short centipede grass. The MM1800 is one inch narrower and a few pounds lighter than the Lawn Hog above, but this doesn’t mean it has less power. 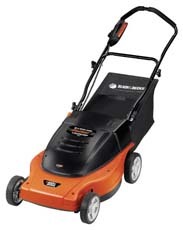 It features a 12Amp motor for dealing with tall grass and mulching leaves. It also comes with a mulch plug insert and a rear bag, so you can either leave mulch on the lawn or collect clippings for disposal. Like the MM875, the MM1800 starts with just the pull of a lever and runs very quietly compared to a gas mower. The only downside is cord management. This mower is made for yards up to ¼ of an acre in size and should be operated within 100 feet of a power outlet. You’ll need to plan out a pattern for mowing so you don’t tangle the cord or run over it with the mower. The wheels are tall enough to handle soggy ground and tall grass without bogging down. The cushioned handle adjusts to your height, a nice touch especially for owners who aren’t average in stature. The deck height raises and lowers with just a single lever from 1-1/4 inches to 3-1/2 inches high. The deck itself is made of a tough plastic and has a lifetime warranty. The only maintenance to do on this mower is cleaning it and keeping the blade sharp. Both of these mowers have a lot of happy owners and they are very similar in capabilities. The main differences are width and weight, so let’s decide between them. If you want maximum lawn coverage in minimum time, consider getting the MM875. At 19 inches wide it’s the bigger of these two mowers. If you want a mower that is a little lighter to lift in case you need to pop it in the trunk of your car, go with the MM1800. 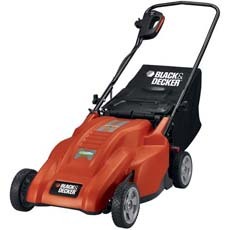 Click here to purchase Black & Decker Electric Mowers on Amazon!